Researchers at the University “Carlos III” in Madrid have developed a virtual reality system for rehabilitation of the shoulder. 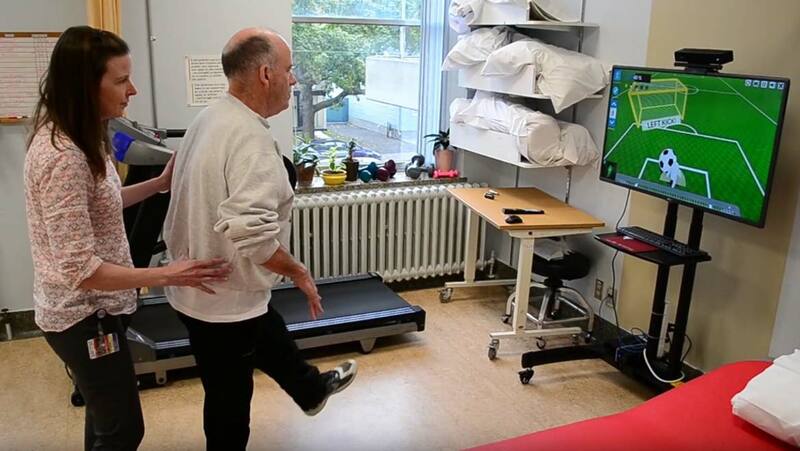 It includes a built-in movement sensor and allows the patient to do controlled exercises as part of a football game. It is hoped that the quality of life of the user is going will be improved through the use of this system. The patients try acting like goalkeepers in a football match and must pretend to catch balls that are kicked towards them. The aim is to encourage the user to make the exact moves which are appropriate for the rehabilitation of the shoulder. “To help maintain the correct position in each save, the patients see the reflection of their hand, which improves the effect of the proprioception, which is the sense that tells the body what position the muscles are in” said Alejandro Baldominos. Virtual reality tends to have no difference from our reality! The movements of our body will be the same as if you were taking part in a real game. This innovation enables the user to do exactly the same exercises as required to improve their injury. An evaluation was completed working with physical therapists and the feedback was very positive. All the patients increased their muscle mass and recovered their strength. The study of the human body involves anatomy, physiology, histology and embryology. Humans are composed of elements including hydrogen, oxygen, carbon, calcium and phosphorus. These elements reside in trillions of cells and non-cellular components of the body. With specific movements, we can transform the distribution and the quantity of these elements! All diseases come from some abnormality of these elements. The adult male body is about 60% water, with a total water content of around 42 liters. At every moment, water escapes the body through sweat, urination, defecation or exhaled breath, among other routes. If a person drinks too much water, in a short period of time, the blood becomes waterlogged. If you drink more than six liters of water in three hours there is a danger of developing something called water intoxication. Water intoxication is a disturbance in brain functions, which results when the normal balance of electrolytes in the body is pushed outside safe limits by over hydration. Water cure, a method of torture in which the victim is forced to consume excessive amounts of water, can cause water intoxication. Healthy kidneys are able to excrete approximately 800 milliliters to 1 liter of water per hour. However, stress reduces this amount. An antidiuretic is an agent or drug which reduces the excretion of water in urine. So, with the combination of these three conditions, there is a danger of death. But, what if you combine taking a diuretic with drinking large amounts of water? A diuretic is any substance that promotes diuresis, that is, the increased production of urine. All diuretics increase the excretion of water from bodies. So, as a consequence, an innovative thought is that we can combine the above with the two novel technologies: Intel RealSense and Oculus Rift DK2. Using these programs, users can check which movements they are performing. Then, with specific movements, we can restore all the body elements to their initial state.